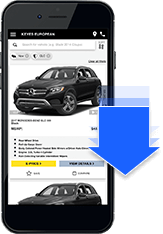 Make it easy for shoppers to browse your inventory. Give your shoppers a newsfeed-like experience with inventory listings that load endlessly as they scroll down the page. 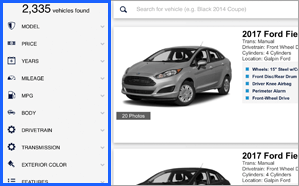 Give shoppers full control over search results with an Amazon-style module that lets them filter by make, model, color, features, body style and more. 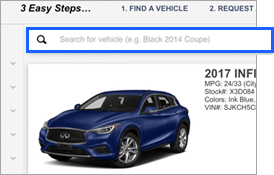 Combine our Multi-Filter Module with our powerful free-text search that allows shoppers to search by any term associated with a particular VIN, be it make, model, features, stock number, and more. 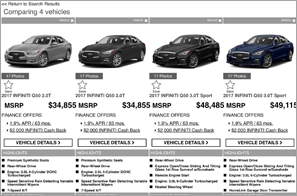 Allow shoppers to compare the price, incentives, features, and highlights of up to 4 vehicles side-by-side, helping them choose the exact VIN they want. 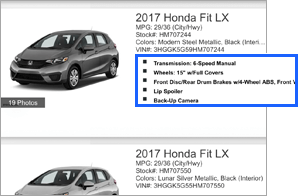 Allow shoppers to curate a list of their favorite vehicles which they can return to at any time – even if they leave your website. 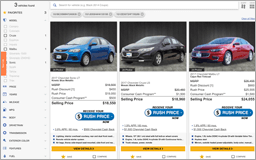 Help shoppers identify key features with vehicle highlights that adapt to their behavior. 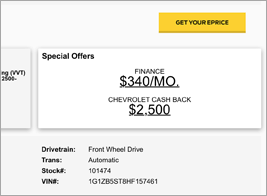 Automatically showcase VIN-specific deals, incentives, and special offers in consumer-friendly packages. 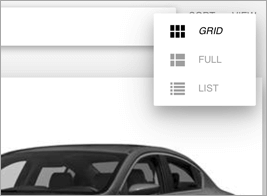 Put shoppers in control of the browsing experience with 3 unique layouts they can activate with the simple click of a button.